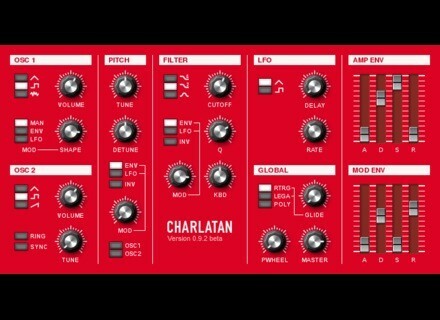 Charlatan, Virtual subtractive synth from BlauKraut Engineering. 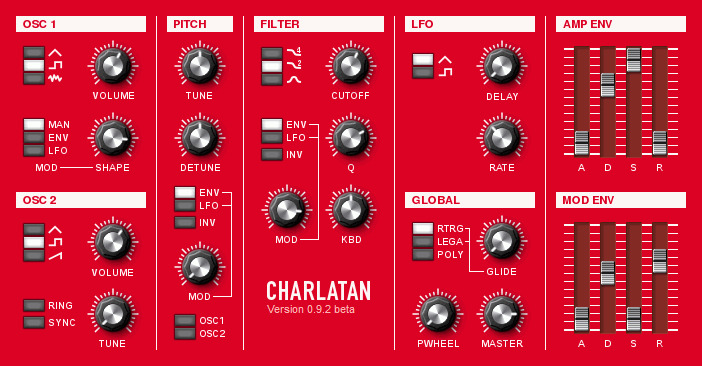 BlauKraut Engineering has updated Charlatan to version 1.1.4. Another revision of the 4-pole ladder filter implementation. Placement of nonlinearities is now correct wrt. the original circuit. New switch 2OCT for Osc2: double detune range (+/-2 octaves). 90 degree phase shift of Osc2 square wave wrt. Osc1 (only when sync is inactive). Emulates behavior of sub-oscs of Roland synths. If Osc1 is set to noise, the ring mod input of Osc1 is now the rectangle signal rather than noise. Reduced max. filter key tracking from 200% to 100%. 200% just isn't useful. Bug Fix: LFO delay parameter was completely hosed (10x the displayed value.). Bug Fix: handle LFO delay time on sample-rate change. Doubled max. LFO delay time (10s -> 20s). Sound Magic The One The One is a way for musicians to process their recordings.